To everyone who has participated in our previous Tuesday Blitz and Chess960 events, thank you. The tournaments have been great fun, and we've had some very interesting games. Regretfully, though, recent attendance has been too low for me to reasonably guarantee that we would have sufficient turnout any given week, and I cannot risk people traveling an hour, as many of you do, to find nothing happening. It seems demand simply is not great enough to support these weekly events at this time, so they will be going on an indefinite hiatus. We may try to organize some larger 960 or blitz tournaments, so do stay tuned for further updates. I would love to hear any thoughts or suggestions, so feel free to comment. On October 20th, the Boylston Chess Club sponsored the Simul in South Station with GM Christiansen. Drawing 21 players, another 15 or so Boylston Chess Club spectators, and dozens and dozens of curious South Station spectators, this event was a big hit. Despite facing 21 players that included a master and several experts, Larry won 18 games, drew 0 games, and lost 3 games, for a winning percentage of 86%. The atmosphere was like a chess "flash mob"-- suddenly, tables with chess boards appeared under the big train schedule board and a GM was taking on 21 players at the same time. Club players, including Masters Eric Godin and Farzad Abdi, started clustering around a demo board and analyzing the game GM Christiansen vs. NM Andrew Wang. The normally boisterous South Station crowd actually drew hushed and clamored to see the action unfold. They whispered in hushed tones asking, "Who is the guy in the middle?" or quietly exclaiming, "GM Christiansen-- I know him! He's a former US Champion." "Three time US-Champion!" someone else corrected. In the end, three players, all seated in a row, where able to win their games. The first to finish was Boylston's own expert, Jesse Nicholas, who earned the GM scalp with the following game. 1. e4 e5 2. Nf3 Nc6 3. Bc4 Nf6 4. d3 Bc5 5. c3 d6 6. Bb3 O-O 7. Nd2 Bg4 8. h3 Bh5 9. Nf1 Bb6 10. Ng3 Bg6 11. O-O Nh5 12. Nf5 BxN 13. PxB Ng3 14. Bg5 Qd7 15. f6 NxR 16. fxg7 Kxg7 17. fxe3 f5 18. Kh1 e4 19. Nd4 Rae8 20. NxN bxN 21. d4 d5 22. Qe1 c5 23. Qg3 Kh8 24. Bf4 Qg7 25. Qh7 c4 26. Ba4 Re6 27. b3 c6 28. bxc4 Bd8 29. Bb3?? Jesse has a promising position, up the exchange, but Larry hangs his queen BxQ White resigns. Two boards away, newcomer Noah Kulick earned a great victory with the following effort. 1.e4 c6 2.d4 d5 3. Nc3 dxe4 4. Nxe4 Bf5 5. Ng3 Bg6 6.h4 h6 7.Nf3 Nd7 8.h5 Bh7 9.Bd3 Bxd3 10.Qxd3 e6 11.Bf4 Qa5+ 12.Bd2 Bb4 13. c3 Be7 14. c4 Qc7 15.O-O-O this seems like a dangerous place for the king Ngf6 16. Kb1 O-O 17. Ne4 Nxe4 18.Qxe4 Nf6 19. Qe2 b5 20.c5 a5 21. Ne5 Rfd8 22. Bc1 Rd5 23.g4 Rad8 24.Be3 Bxc5 25.Nxf7 Qxf7 26. dxc5 Ne4 27. f3 Ng3 28. Rxd5 exd5 29. Qg2 Nxh1 30. Qxh1 d4 31. Bc1 Qd5 32. g5 d3 33. Bd2 Qxc5 34.Qe1 hxg5 35. Qe6+ Kh8 36. Qe1 Rf8 37. Bc3 b4 38. Bd2 Qf5 39. Qe7 Qxf3 White resigns. Finally, NM Andrew Wang, the strongest player in the field, secured a late victory after another blunder from the GM. Curiously, Andrew was seated right between Jesse and Noah, and some wondered if such a strong master-level player such as Andrew might have created a challenging nexus of players for GM Christiansen at that end of the table. Thanks to all for making this a great event! Thanks especially to GM Christiansen, who was gracious and put on a great show in a bustling train station. Also thanks to South Station for allowing us to stage such an event in the middle of the crowd. We hope that the Boylston Chess Club and South Station can continue our partnership to provide chess spectacles in the future. Just a reminder to everyone, tomorrow we will have blitz and Chess960, side by side, starting at 7:00 P.M. Entry (for either event) is $5 for members, $10 for non-members, and at least 60% of the entry will go to prizes. Format is double round-robin, though that is subject to change based upon turnout. Registration begins at 6:15. No USCF membership is required, so PLEASE BRING YOUR FRIENDS! In the Chess Cafe Video Spotlight, Kyler Donlan recently spotlighted the game Christiansen v Adorjan in 1982. If you want to prepare for the Christiansen simul on Thursday, Oct. 20, why not watch the video from the British series "The Master Game" and learn how Larry thinks about a game. Also, check out his 80s look, with long hair and mustache. The October Legends of Chess Tournament a Success! This last Saturday (15 October) the Boylston CC October Legends of Chess Tournament was held. Doc Kinne, Boylston Chess Club's new Clerk, directed, this being his first tournament of this type as Chief Arbiter "without a net" since 1992. Basically things went smoothly, although there were some exciting moments. Initially we had only 5 players signed up for the Under 1800 Section, so that section was merged into the Open Section and Under 1800 Class prizes were given. In the end 26 people battled across the checkered board on this middle Saturday in October. a promising new player who's recently been attending our tournaments. They all achieved 2.5 points. Second Place was garnered with 3 points by International Master Marc Esserman. Finally, the tournament was swept with a perfect score of 4.0, and First Place was awarded to FIDE Master Christopher Chase! I'd like to close by reminding everyone that we have a magnificent opportunity both for a good amount of fun and the chance to really promote our Club this Thursday, 20 October. Make sure you attend the "Simul in South Station" this Thursday at 5:00PM. Our own Grandmaster Larry Christiansen will be taking on 20 people across the board. This event is free and will be really watched by the public. Bring your friends! This is the perfect opportunity to introduce that friend who wonders what you do on Saturday afternoons!! The Grand Prix is nearing the final stretch, and many of the top prizes are still up for grabs! Even if you are not qualified for one of the prizes this year, it is still the biggest chess bargain in New England-- 4 rated games for only $7.00 to members, $10.00 to non-members. The Leaderboard is shaking up, with lots of changes up and down the line. Here are the current standings, with the runners-up nipping at the leader's heels. In the U2400 section, Eric Godin has launched to the top with a 3.5/4 performance last month. Tian Rossi continues to grow his lead in the U2200 section, where he has been on top since the beginning. In the U2000 section, Jason Rihel's 3-month hiatus has allowed several players to get within one point. (I hope to get some games in this month!) That section will be decided by the last few events. Robert Holmgren has reached the 20 point milestone in the U1800 section, but even that result is not safe from the competitive U1600 crew who are waging a 3-way war. Steven Stepak has clawed out a 0.5 point lead in that stacked U1600 section, but Mark Neale and David Martin are one good event away from retaking that lead. There is a shakeup in the U1400 section, where Allen Wang is now in a 2 point lead. Finally, Arthur Tang's 6 points is still enough to maintain the U1200 lead, but he has a long trail of up-and-comers waiting for one good Grand Prix result to leap into first. GM Larry Christiansen Simul in South Station! The games will take place right under the Train Schedule! Prizes for anyone who can beat GM Christiansen! Please come and help us make this a special event. The Queen's Gambit is quite a different book than Los Voraces 2019. It's written by chess amateur and English Professor Walter Tevis. Tevis has previously critically aclaimed credits with regard to novels with 1959's The Hustler (Some of us have seen the movie). The Queen's Gambit has not a single chess diagram in it, not a single chess move in any sort of recognized notation. This book may be something you give to your sister to explain what you do. Written before the Polgar sisters came to the stage, the book posits, in a way, what might have happened if Bobby Fisher had been, say, a girl? The book follows the childhood of orphan Beth Harmon as she discovers and is taught our game she finds being played by a janitor in the basement of her orphanage. Beth develops her abilties, but developing as an orphan and a girl in what is essentially a man's world is not easy. As Beth develops as a player she struggles against sexism, drug abuse, alcoholism, and death. We watch as Beth wins - and loses - her way up the ladder of chess championships as she develops and starts to pursue her dream of becoming World Champion...very much like a boy we all know did so very long ago. Non chess-players can read, understand, and enjoy this book with no problems. Chess-players likewise will enjoy this book as long as they don't take it too seriously. There are technical details in the text that will irk players. Just slide past them, seriously. Just as it was once thought that peanut butter and chocolate were great tastes bound to live in eternal separation, so too was it not so long ago that Blitz and Chess960 were fun events bound to occur in alternating weeks. No longer. Starting this coming Tuesday, October 11th, we will be having Blitz and Chess960 side by side, every week. Events will each start at 7:00 P.M., with registration beginning at 6:15. Each event is $5 for members, $10 for non-members. You can play in both, but that would be really hard. Time controls are G 5 for Blitz, G 15 for Chess960. Tournament formats are to be decided and based upon attendance. NO USCF MEMBERSHIP IS REQUIRED, so bring your friends! "Unplayed Opening Discoveries and Experiments"
Sun, Oct 9: 9:30 -9:55 AM. Hi everyone-- The South Station experiment is officially starting this Thursday and Friday, roughly 11:30-1PM October 6th and 7th. I will personally be there to try to get everything in place, and I will let the club know of other times next week that someone will for sure be there. Keep in mind that the plan is to have chess sets available to anyone from the club who wants to use the South Station space. So, while I am going to be there the first couple of days, starting next week I hope that our members will take the initiative to use our boards and sets whenever they want. I'm a big reader. The largest thing I own isn't a bed or a TV, its a 1200 volume library. It is also the very worst thing I own if you ask my friends who helped me move here four years ago. I'll tend to read everything and indeed, I honestly understand Klingon psychology better than I understand someone past the age of 7 who can't read. Unsurprisingly perhaps over the last several months I've been reading chess books. But not only things like GM Andy Soltis's Pawn Power in Chess, or IM Jeremy Silman's How to Reassess Your Chess. I've also been reading "chess novels" - books with chess as some sort of central theme. Sorta like the printed equivalent of Searching for Bobby Fisher. The first I really read was Los Voraces 2019 by Grandmaster Andy Soltis. Now, you may remember that Andy was my 2nd favorite Grandmaster when I was a kid (and right now the only one of my favorite three who is still alive. But I don't like to talk about that!). A lot of us should be somewhat familiar with Andy's instructional books such as The Art of Defense in Chess. Some of you might be familiar with a couple of his history books such as The United States Chess Championship, 1845-1996. Apparently some people wish they weren't quite as familiar with Andy's Opening Monographs. But Los Voraces 2019 apparently is Andy's first attempt at a novel after a lifetime of being an instructional writer and journalist. Originally written serially between September 2001 to September 2002 on ChessCafe.com, the book was put together in 2004. That copyright date actually gives the book some unintended humorous moments. Los Voraces 2019 is the story of the Sheldrake Memorial Tournament held in a small New Mexico town where the rules for this tournament of the near future are "no seconds, no agents, no computers, no entourages, no pagers, no phone calls, and no outside contacts" until the tournament is over. 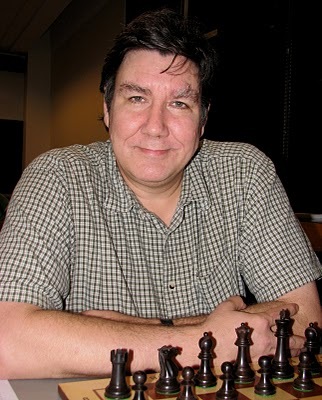 Mr. Sheldrake is dead, but his will has given a prize fund of $20m for the ELO Top 14 in 2019, including the World Champion, to compete in a Round Robin tournament. But, one by one, as the tournament moves forward round by round, its participants start dying, often right in front of one another. Our guide and narrator through all of this is the tournament's Arbiter. I'm sure some of you could see why that would appeal to me! The Arbiter is never named, and in my mind's eye I assumed he was Soltis himself following in the great tradition of those Grandmasters that became International Arbiters at the ends of their careers. The book is not high on characterization, and I don't think its supposed to be, really. Andy is commenting on the stereotype of Grandmasters, and I think he hits several nails on the head, as well as a couple of sacred cows. You have the World Champion who thinks he's better than everyone (and everything) else. The 13 year old prodigy. The 27 year old ex-prodigy. The weird player who apparently doesn't speak English. Two women GMs who apparently hate each other so much, they physically fight whenever they're in the same room. The characters are not deep, but they're funny. And maybe just a tad insightful. The book reads like an old-style mystery novel. The tournament goes on. Players die. And our hero the Arbiter, with the reluctant help of the local sheriff and a couple of others, try to figure out the whys and wherefores while simultaneously keeping the tournament going and the players calm enough to play. The ending surprised me, but I'm easily surprised by these things. "And I forfeited Popov once in a rapid-play tournament for using an EGD." "It stands for eyeglass display, a kind of wearable computer. In this case it fed opening analysis to the lower part of his prescription frames. Sorta like movie subtitles." "Ingenious. By the way are there any Americans in this American tournament?" One. Todd Krimsditch. He thinks he's the next Bobby Fisher. But even today, Fisher could probably give him a pawn and move - and Bobby will be 77 in March." Through it all chess is actually played at the Sheldrake Memorial and we get to see the actual moves and games through game scores, analysis done within the story line, and with diagrams - the only time I've ever seen that done. Los Voraces 2019 is probably not a book you'd recommend to your sister to explain what you do on weekends. There are far too many in-jokes But if understand and appreciate algebraic notation, know what a Round Robin tournament is, and recognize the names Korchnoi and Petrosian (and know why these two men are anything but a mutual admiration society), I think the novel can be a lot of fun. The book is available from interlibrary loan (my copy came from the Appalachian State University). It sells somewhat pricy for $30 on Amazon. Finally its actually available as an eBook from the Android Marketplace for $10, which I thought was neat.